Through early ice break up in arctic regions such as Hudson Bay in Manitoba, Canada (as a result of global warming) as well as through pollution, the polar bear has been deemed a threatened animal under the Endangered Species Act of the USA. 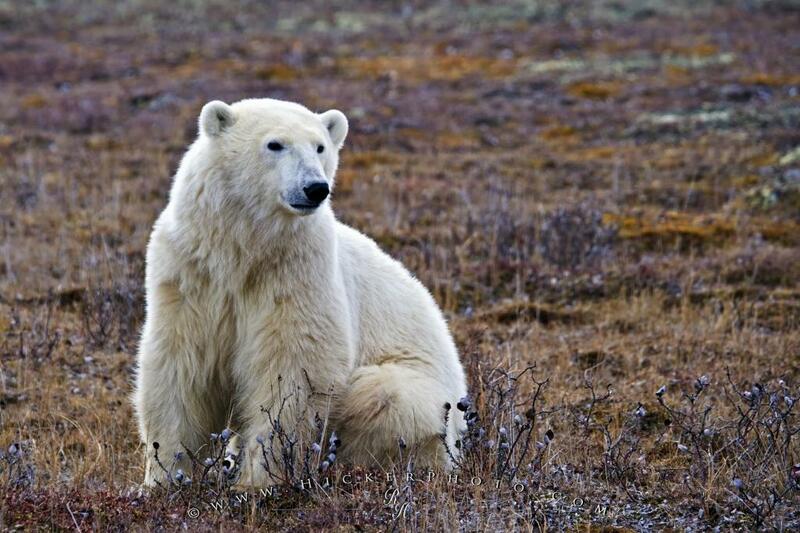 A buzz word for the early 21st century - global warming has become a serious threat for the future of many animal species including the mighty polar bear, which under the Endangered Species Act of the USA was designated a threatened species. As arctic dwelling animals, polar bears rely on the build up of sea ice in order to access their food source - ringed seals, which live in abundance in Arctic waters. The late arrival of snow and ice build up due to global warming in places such as Hudson Bay in Manitoba, combined with the early sea ice break up in spring means that the window for polar bears to hunt seals is greatly reduced. A shorter hunt means that they don't have enough time to build up their body fat reserves which is what they need to survive on during the summer fast. Photo of a polar bear - an animal recently designated threatened on the endangered list, Manitoba, Canada. ... High levels of toxins are stored in the blubber of their prey which is transferred to them when they eat. Late winter - global warming, Polar Bear, Ursus maritimus, in the Churchill Wildlife Management Area, Hudson Bay, Churchill, Manitoba, Canada. I photographed this photo with the digital SLR camera model Canon EOS-1Ds Mark II, aperture of f/6.3, exposure time of 1/400 sec. on ISO 200, as always I used a original Canon Lens, the focus lenght for this picture was 260mm.